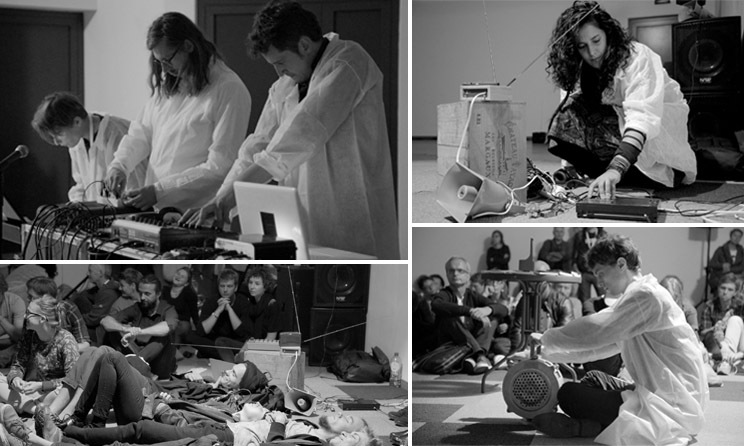 Critical Band Ensemble seeks to make audible the actual inner workings of the politics of amplification and the psychopathological symptoms of instrumentalised disinformation by means of real-time processing of voice and recording, modulation of signal, and spatial diffusion of sound and radio waves. Members: Donia Jourabchi, Taufan ter Weel, Edyta Jarząb, Dorian Batycka and Krzysztof Marciniak. Thanks to Sanatorium of Sound, especially Gerard Lebik and Zuzanna Fogtt. Special thanks to Piotr Motyl and Adrian Dzwiek for technical and practical support.